Purchase 1200 x 597 pixel digital file by using the Buy Now buttons below. You will receive an email with the download link. You can use the link 5 times to download the digital file. 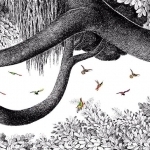 A surreal visual tour of a secret forest. Far from the eyes of civilization. Birds frolic in an empty space let open in the canopy of the otherwise dense foliage. The color of the little birds against the monolithic black and white backdrop of the forest create a balance that Umakant Kanade successfully uses as a signature in many of his paintings..
New artwork uploaded. A surreal visual tour of a secret forest. Far from the eyes of civilization. Birds frolic in an empty space let open in the canopy of the otherwise dense foliage. The color of the little birds against the monolithic black and white backdrop of the forest create a balance that Umakant Kanade successfully uses as a signature in many of his paintings. Umakant Kanade. 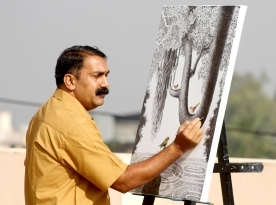 Born in 1965 in Maharashtra, Umakant Kanade completed his art education from the Abhinav Kala Mahavidyalaya, Pune in 1990.